The first thing you need to do to make this scrub is take your avocado, cut it into halves and mash one half in a bowl. Once you mashed it enough that it looks like guacamole, add your lime juice, coconut milk, and witch hazel. Once you mix these together, you are going to add the salt. Start off with 4 Tablespoons of salt. I did 2 of fine salt then 2 of course salt. I Then added some more fine, this part is really up to you and how you like the texture of your scrub. I recommend if you plan on using it on your face to do more fine salt then course salt so it is not as abrasive on your facial skin. This next step is optional, it just gives the scrub that cool ocean-lagoon color, as well as the look of Lush's Ocean Scrub. Add a couple drops into the avocado and stir it until it is evenly distributed. I tested it out, the dye does wash off but I don't know if I would use the dye if I was using it on my face! Once finished mixing, add scrub to your small container. This final step is another step to give it that Lush look alike so it is optional. 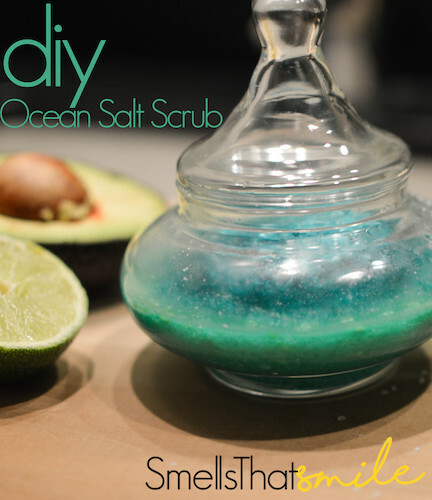 Take 1-2 Tablespoons of Course Salt and add it to a small bowl then add a drop or two of blue dye. Mix it until it is evenly distributed then pour on top of scrub. You now have an awesome scrub that will get rid of all that dead skin and leave your skin feeling smooth and hydrated! Add lime juice, coconut milk, and witch hazel. Add salt. I started with 2 Tbsp of fine and 2 of Coarse. Add more fine salt if you want it less abrasive. Keep adding salt until your liking. In other small dish, add 1-2 Tbsp of Coarse Salt and a drop or two of blue dye (optional) mix together. Then add to top of scrub.